No matter how wonderful Cape May is, even those of us who live here venture a little further afield from time to time. In addition to having so much to offer within the boundaries of Cape May County, South Jersey also offers other great wildlife opportunities just an hour away - so which direction to head - and when? Well, in winter, or during late summer shorebird migration, heading up the coast to Atlantic County will get you to the Forsythe National Wildlife Refuge - perhaps better known simply as Brigantine. By heading north-west in spring, the spectacle of shorebird migration reaches a peak in the impoundments at Heislerville in Cumberland County, while hopping on the ferry for a slightly longer journey timewise, you can watch for a few inshore seabirds during the crossing to Delaware then head to Bombay Hook for breeding shorebirds, or explore the Cape Henlopen area for Brown-headed Nuthatches. Heading out in the early morning light, we pushed out to sea for a little over an hour and set ourselves up in a likely looking spot a little over 30 miles from shore. The waters off New Jersey don't team with seabirds like you might find off California or the Maritimes, but we do get some interesting birds passing by - all you need to do is to attract them in. Armed with all the kit necessary for some small-time shark fishing, we began the ritual of 'chuming'; this involves spreading a slick of a rather evil-smelling cocktail of various mashed fish and fish oils. Though pretty smelly to us, it's heaven on earth for sharks and for seabirds, and it took no more than three minutes for the first Wilson's Storm-petrel to join us. For much of the day, we had up to a dozen of these delightful little birds skipping around the boat and, before long, they were joined by the first of six or so Great Shearwaters that also came to check out what was on offer. Many seabirds are strictly pelagic, coming to land only to breed - and then more often than not on some remote island in the middle of a distant ocean - so they can be notoriously difficult to see well unless you go out into their world. A trip offshore to look for seabirds can be very hit and miss and repeated visits are often essential if you want to get a good set of birds, but today we got lucky with all sorts of great wildlife. We started with a Loggerhead Turtle drifting at the surface which seemed to be fast asleep and totally oblivious to us until we were virtually along side. A couple of whale sightings followed - though too distant to be sure of the species - and this was followed by a rapid-moving school of highly-energetic, Spotted Dolphins. A couple of Manx Shearwaters and a couple of Cory's Shearwaters also passed our way but showed no interest in our activities. The movements of such birds are poorly-known in our area and the paucity of records of such birds for Cape May probably owes as much to a lack of people looking as it may do to the actual occurrence of the birds. So, the birds were certainly exciting, but what of the sharks? Well it proved to be a rather quiet day, but we did get a very feisty young Mako Shark on the line for a while - a truly insane little beast, just three feet long but biting all the way!! And we also caught a Scalloped Hammerhead Shark; though small numbers of some shark species can be taken sustainably as food, we were here to tag the animals for research purposes and both were released to live another day. Next time you are in Cape May and you want to try something different to get away from the summer heat, give a thought to joining an offshore boat trip - and let us know what you find! The first of two Loggerhead Turtles that we saw today, this one was loafing at the surface and enjoying a nap. Sadly, all too many sea turtles are killed when they try to eat balloons that they mistake for jellyfish - a common prey item of several species of sea turtle. It is saddening to report a remarkable number of casually lost, released or abandoned balloons floating out in the open waters - all just waiting for a turtle. We hauled in several and brought them ashore for proper disposal [photo by Mike Crewe]. Wilson's Storm-petrel is one of the commonest seabirds in the world, breeding in the southern oceans before heading north to spend their 'winter' (our 'summer') in the Northern Hemisphere. We noticed a good number of juvenile birds, such as this one, identifiable by its almost immaculate plumage [photo by Mike Crewe]. In contrast to the dapper youngsters, adult Wilson's Storm-petrels are currently in molt, causing a strong contrast between the faded brown old feathers and the blackish-brown new ones. Notice the difference in color between the inner and outer primaries in the wings [photo by Mike Crewe]. The twisting and turning antics of these birds as they patter over the surface and pick up bits of our chum gave plenty of opportunity for us to burn up an amazing number of megapixels today!! I particularly liked this one, which nicely shows off the yellow webs between the toes of a Wilson's Storm-petrel [photo by Mike Crewe]. Great Shearwaters are more boldly marked than many other shearwater species and, if seen well enough, can be readily identified by their dark brown caps, white rump patch and scalloped appearance to the upperparts [photo by Mike Crewe]. Summer is here, it's time to go birding!!! Location Abbreviations: BSF (Belleplain State Forest), CMP (town of Cape May Point), CMPSP (Cape May Pt. State Park), SCMM (South Cape May Meadows), SHPt (Stone Harbor Point). Cape May's summering scoters continued their stay, with at least 1 Surf and 70 Black Scoters still present around CMP through the week (m. ob.). White-winged Scoter is notable in late-June, and 2 were seen from the Wildwood Crest area 27 Jun (TN). At least one pair of Gadwall continued to occupy SCMM, though breeding has apparently not yet been confirmed this year (m. ob.). As per usual, there are a few Common Loons spending the summer locally-- reports this week included 2 offshore SCMM 21 Jun (TB, TG) and another near the north end of Ocean City the same day (RM). Yet another was northbound over SCMM 25 Jun (MiC). A whale-watching trip out of Cape May netted 2 Great Shearwaters and 16 Wilson's Storm-Petrels on 24 Jun (WC, DL, TR). Single Great Shearwaters were also seen from shore at Avalon 24 Jun (MeC, MiC) and at CMPSP 25 Jun (MiC et al.). At least 18 Wilson's Storm-Petrels were tallied from CMP 26 Jun (VE et al. ), where the species was fairly reliable this week. Brown Pelican made its presence known on a daily basis, and reports included a high count of 18 at Sunset Beach on 24 Jun (JW). There were no reports of Northern Harrier at Cape Island this week-- observers are encouraged to note any additional sightings of that species through the end of July. BSF was home to a Broad-winged Hawk 27 Jun (MO'B, LZ). Piping Plover continued to have an atrocious breeding season, with only 3 pairs active in the county as of 27 Jun (NJDFW). American Oystercatcher is faring a bit better on the barrier islands, with 25+ active pairs, many of which are at SHPt (NJDFW). A group of 4 Lesser Yellowlegs were apparently new arrivals at SCMM 27 Jun (m. ob.). At least 1 Whimbrel was seen between SHPt and Nummy Island this week (m. ob.). Lesser Black-backed Gull continued to be found on oceanfront beaches such as Avalon, SHPt, Wildwood Crest, SCMM, and Cape May Point (m. ob.). A trio of Gull-billed Terns appeared at CMPSP 22 Jun (MJ), where there hadn't been any recent sightings. Royal Tern became a daily sight in recent days, particularly at SHPt and Cape Island (m. ob.). A Red-headed Woodpecker was noted at The Nature Conservancy's Lizard Tail Swamp Preserve, a known breeding location, on 24 Jun (WK). Yellow-throated Vireo is a scarce breeding bird away from the Weatherby Rd. area in the far northern reaches of the county-- one remained on territory at BSF 27 Jun (MO'B, LZ). Other birds noted at BSF on 27 Jun included Summer Tanager, Acadian Flycatcher, Worm-eating Warbler, and Prothonotary Warbler (MO'B, LZ). Tom Baxter (TB), Warren Cairo (WC), Megan Crewe (MeC), Mike Crewe (MiC), Vince Elia (VE), Tom Gleason (TG), Matt Jewell (MJ), Will Kerling (WK), David Lord (DL), Robert Maurer (RM), NJDFW (New Jersey Divison of Fish & Wildlife staff), Tom Nolan (TN), Michael O'Brien (MO'B), Tom Reed (TR), Jim Waldie (JW), Louise Zemaitis (LZ). eBird. 2012. eBird: An online database of bird distribution and abundance [web application]. eBird, Cornell Lab of Ornithology, Ithaca, New York. Accessed 27 Jun 2014. Available: http://www.ebird.org. Location Abbreviations: CMP (town of Cape May Point), CMPSP (Cape May Pt. State Park), SCMM (South Cape May Meadows), SHPt (Stone Harbor Point). The back bays and oceanfront again played host to above-average numbers of summertime ducks. Sightings from the Jarvis Sound area included a continuing Brant, a Surf Scoter, 10 Black Scoters, and 4 Red-breasted Mergansers throughout the period (VE, BL et al.). At least 60 Black Scoters could still be found around CMP most days (m. ob.). A male Wood Duck and 4 Gadwall occupied SCMM 19 Jun (MG, GR, TR). A Great Shearwater was seen from the north end of Avalon 15 Jun (JS, MB), and another was reported a few miles offshore Wildwood 18 Jun (CMWW). Brown Pelican reports were on the rise this week, with near-daily sightings at Cape Island and along the barrier beaches (m. ob.). Mississippi Kite was last encountered 15 Jun, when 2 were seen from SCMM (SR, TR). A male Northern Harrier was again reported around Cape Island on several days, leaving open the possibility that the species is breeding locally (m. ob.). Another Harrier was glimpsed at Tuckahoe WMA 17 Jun (TR). A Wilson's Plover was a stellar find at SHPt 20 Jun (TP, m. ob.). It made for the third county record since 2011, all of which have occurred at the same site. Scarce in June, a single Whimbrel was in the Jarvis Sound area 15 Jun (BL). A little taste of fall came by way of an Eastern Willet and 3 Short-billed Dowitchers that zipped south past CMPSP 18 Jun (MG, TR). Lesser Black-backed Gulls often accumulate along oceanfront beaches through the summer-- 11 were tallied at SHPt 15 Jun (TB). Reports of Gull-billed Tern have been few since May; one was at Tuckahoe WMA 17 Jun (MC, TR). 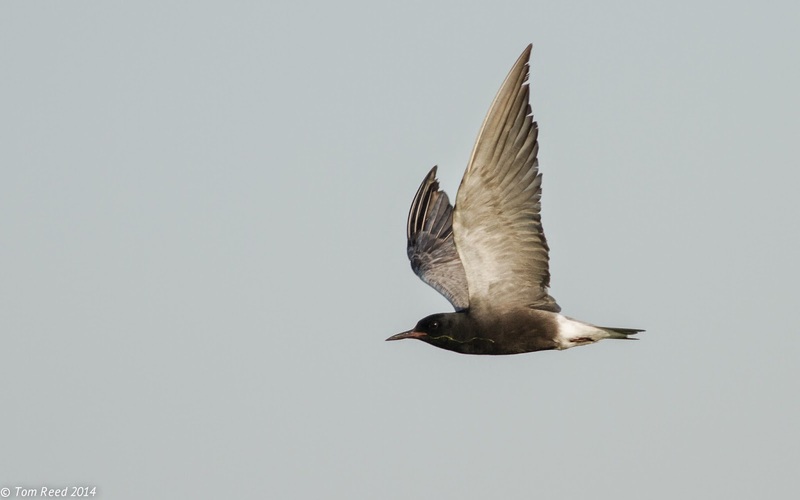 A Black Tern appeared at CMPSP 14 Jun, and 1–2 individuals stayed put in the immediate area through at least 19 Jun (SR, m. ob.). Royal Tern remained difficult to track down this week, with only a handful of reports, mainly from CMPSP and SCMM. The 3 Black-billed Cuckoos found between CMPSP and SCMM 15 Jun were potentially northbound migrants (MO'B, SR, TR), and a Yellow-billed Cuckoo was a peculiar find at SHPt 20 Jun (JD et al.). Willow Flycatcher has been fairly reliable at SCMM in recent days; 3 were found there 19 Jun (MG, GR, TR). A vocal Warbling Vireo at West Cape May was quite out of place 15 Jun (MO'B). Perhaps a product of northwest winds, 3 Bank Swallows headed south across Delaware Bay from CMP 18 Jun (VE, MG, TR). At least 3 Northern Parulas were heard singing at Head of River 17 Jun (MC, TR). Tom Baxter (TB), Michael Britt (MB), Cape May Whale Watcher (CMWW), Mike Crewe (MC), Jim Dowdell (JD), Vince Elia (VE), Mark Garland (MG), Bob Lubberman (BL), Michael O'Brien (MO'B), Todd Pover (TP), Tom Reed (TR), Gibson Reynolds (GR), Steven Rodan (SR), Jon Stippick (JS). eBird. 2012. eBird: An online database of bird distribution and abundance [web application]. eBird, Cornell Lab of Ornithology, Ithaca, New York. Accessed 20 Jun 2014. Available: http://www.ebird.org. Lingering waterfowl remained in the headlines this week. Single Brant were noted along the Intracoastal Waterway near Ocean City 8 Jun (CD, TJ, TR) and near Wildwood 9 Jun (VE, BL et al.). Black Scoters continued to occupy the mouth of Delaware Bay near CMP; the week's high count of 88 was obtained 8 Jun (TJ). A handful of Surf Scoters also remained in the same area (m. ob. ), and a Red-breasted Merganser stayed put at High's Beach through at least 7 Jun (WK). It's a good time of year to search for pelagic birds. At least 28 Wilson's Storm-Petrels were enjoyed from the Cape May Whale Watcher 7 Jun (JS, BD), while others were occasionally spied from land at Cape Island through the week (m. ob.). A Wood Stork, soaring over the Middle Twp. bike path near Burleigh, was an exciting find 10 Jun (NW). It has not been reported again. Single Northern Gannets were noted offshore CMP 11 Jun (KL, WC, CM), and near Ocean City 9 Jun (RM). 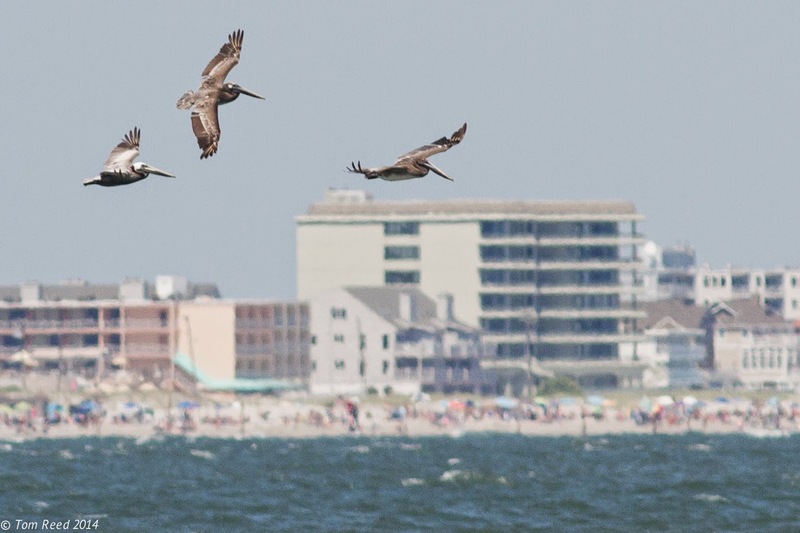 Brown Pelicans continued to be scarce-- the week's only report was of two birds seen from Poverty Beach 9 Jun (TB). Mississippi Kites were reported over the Rea Farm/Beanery 7 Jun (m. ob.) and over CMPSP 13 Jun (KL). A bit out of place during summer, a Northern Harrier was seen around Cape Island through the week (m. ob.). Always notable from shore, a Red-necked Phalarope flashed past CMP during the early-AM 8 Jun (TJ). Other shorebird highlights included 60 Semipalmated Sandpipers lingering at SCMM through 9 Jun (m. ob. ), with another 100+ seen along the Intracoastal Waterway 8 Jun (CD, TJ, TR). Additional late-staying shorebirds included 20 Dunlin and 60 Short-billed Dowitchers in the marshes between Avalon and Ocean City 8 Jun (CD, TJ, TR). Piping Plover numbers are very low along the Atlantic Coast beaches, with only 7 active pairs in the county as of 13 Jun (fide NJDFW). Several Lesser Black-backed Gulls could be found at SCMM and CMP through the week, and another was at SHPt 7 Jun (TB). Royal Tern has been an irregular sight along the Atlantic Coast and at Cape Island; most sightings this week involved singles (m. ob.). Noteworthy at Cape Island, Acadian Flycatcher is apparently nesting at Higbee Beach WMA this year (fide SR). Willow Flycatchers have settled into traditional breeding locations, such as CMPSP, SHPt, and the Two Mile Beach Unit of Cape May NWR (m. ob.). A late Warbling Vireo was noted at Belleplain State Forest 7 Jun (BR). Black-throated Green Warbler isn't known as a breeding bird in Cape May County, making a pair observed at Head of River 7 Jun particularly noteworthy (MC et al.). CMP was home to two significant discoveries this week. A Yellow-throated Warbler nest was found at CMPSP 12 Jun (WC, CSl), possibly representing the first documented nesting attempt at Cape Island. A Northern Parula pair was observed feeding young along Seagrove Avenue 13 Jun (MO'B). 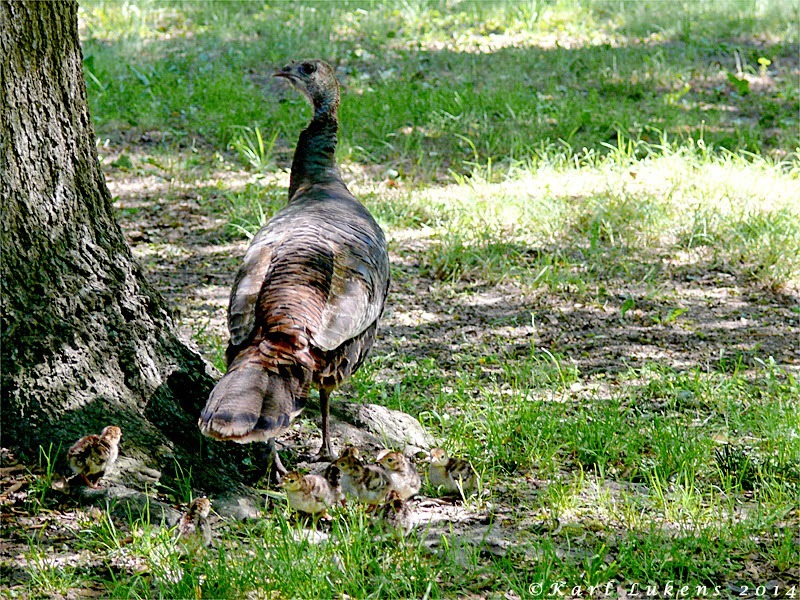 This potentially represents the first confirmed breeding in Cape May County since the 1990s. Tom Baxter (TB), Warren Cairo (WC), Mike Crewe (MC), Christina Davis (CD), Bob Dodelson (BD), Vince Elia (VE), Tom Johnson (TJ), Will Kerling (WK), Bob Lubberman (BL), Karl Lukens (KL), Christina Marks (CM), Robert Maurer (RM), NJDFW (New Jersey Division of Fish & Wildlife staff), Michael O'Brien (MO'B), Tom Reed (TR), Bill Roache (BR), Steven Rodan (SR), Chuck Slugg (CSl), Jon Stippick (JS), Nancy Watson (NW). eBird. 2012. eBird: An online database of bird distribution and abundance [web application]. eBird, Cornell Lab of Ornithology, Ithaca, New York. Accessed 13 Jun 2014. Available: http://www.ebird.org. The Turkeys are Taking Over! Back in early March, I was strolling through the fields at Higbee Beach WMA when a bundle of dead leaves caught my eye. Nothing so unusual about that you might think, but eye-brain co-ordination is an intriguing thing and some deep-seated search image was trying to push its way to the front of my conscious mind. I walked into the vegetation a few paces and the bundle of leaves took on clearer features - the leaves were all pulled together and bound up with silken threads. This was clearly some sort of coccoon but no ordinary coccoon as this baby was some four inches long!! A quick check around the outside revealed no exit hole and a little shake revealed that there was still a chunky object inside - the chrysalis of a moth, and a big one at that! The cocoons of the Saturniid moths are mostly designed to look like something that would be of no interest at all to anything predatory - and a bundle of old leaves serves the purpose just grand [photo by Mike Crewe]. Knowing that it was the perfect time of year for the meadows to be cut to help deter invasive plants and promote native species, I feared for the survival of this coccoon. While caterillars can crawl and adult moths can fly, the pupation stage of a moth is a real weak link in the life cycle. While the caterpillar metamorphoses into a moth, it can do nothing but hope; hope that it has chosen a safe, protected place to hang out for the duration, and hope that its camouflage fools potential predators. For many moth species, pupation takes all winter, so there is plenty of opportunity to be found out. The one I had spotted was just six inches or so off the ground, attached to a small sumac sprig and clearly right in harm's way. I broke off the twig below the coccoon and took it home, propping it upright in a small pet container that I keep for just such occasions. Forgotten that is until my wife presented me with it one day and there, quite freshly emerged was a spectacular female Cecropia Moth - our largest moth species. Though we had missed the emergence of the strangely yukky-looking creature that presents itself before the wings have been pumped up, the tips of the wings were still a little soft and floppy, so it had only emerged within the hour. What it must be like to go through a complete metamorphosis and just how much the creature is aware of is something we can only ponder on, but it is certainly a remarkably complex process and one we shall - thankfully - never have to experience!! We released our moth at dusk (when there is a greatly reduced chance of a bird making off with it) into the back garden, resting her on a tree trunk from where she could head out in her own time. The vibrant colors and spectacular size of our freshly-emerged female Cecropia Moth. Eye spots are common features of moth wings and appear to serve as startling mechanisms for would-be predators. Some researchers also think that the curved and rounded wing tip of a number of Saturniid moths may even be mistaken for a snake head [photo by Mike Crewe]. As we head into the hot days of summer, the telephone continues to ring at the Northwood Center, but the inquiries switch topic. Questions such as "Are the Red Knots here yet?" or "When will the warblers arrive?" are replaced by "I found an abandoned baby bird....". June is perhaps the busiest month for rehabilitators receiving calls about lost or abandoned baby birds, so here's a few quick pointers for you should you be about to pick up the phone and call on this topic. Firstly, folks who can deal with lost or abandoned baby birds are few and far between; there is a rigorous licensing system in place, designed to ensure that any injured animal that is taken in, is taken in by someone who knows what they are doing, and who has the facilities to take care of the creature until it can be (hopefully) released back into the wild. Secondly, we at Cape May Bird Observatory are not licensed, nor do we have the facilities to care for injured wildlife. So what is best? Well, if you do call us, we can certainly give you the number of your nearest rehabilitator, who should be contacted directly for advice. But, back to those lost or abandoned baby birds - it is fair to say that the vast majority of lost or abandoned baby birds are not lost or abandoned and, in most cases, the best thing to do is to leave them alone - mum or dad will be nearby somewhere and will return to feed them once the coast clear - and that means once we humans are out of the way! If you are hovering near a baby bird, the parents are going to keep their distance until you withdraw. If you find a young bird in an open place that you feel might make it vulnerable - outdoor and feral cats take a massive toll of birds at this time of year - you can perhaps move the bird to a place with more cover, and preferably on a branch where it will be off the ground - but don't move it too far. Perhaps the trickiest baby birds for most people to come to terms with are young owls. In many species of owl, the youngsters leave the nest before they can fly and clamber around in the trees. At this stage they are often known as 'branchers'. Occasionally, such birds fall to the ground, but they are lightweight and covered in fluffy down so usually survive the indignity. Many people finding such birds think they are abandoned - even watch them for long periods and see no adults visiting with food. But, of course, owls are nightbirds and the parents won't be back to tend to the youngster until it gets dark. Again, if you find a young owl sitting on your lawn, the safest bet is to lift it up on a branch, somewhere with a little cover where it will be safe from ground predators. Don't forget though that owls have pretty sharp claws, so wear proper protective gloves or similar, or call your local rehabilitator or animal control officer who will lift the bird out of the way for you. Just remember, above all, most baby birds are not lost or abandoned - misguided maybe, but not lost!! 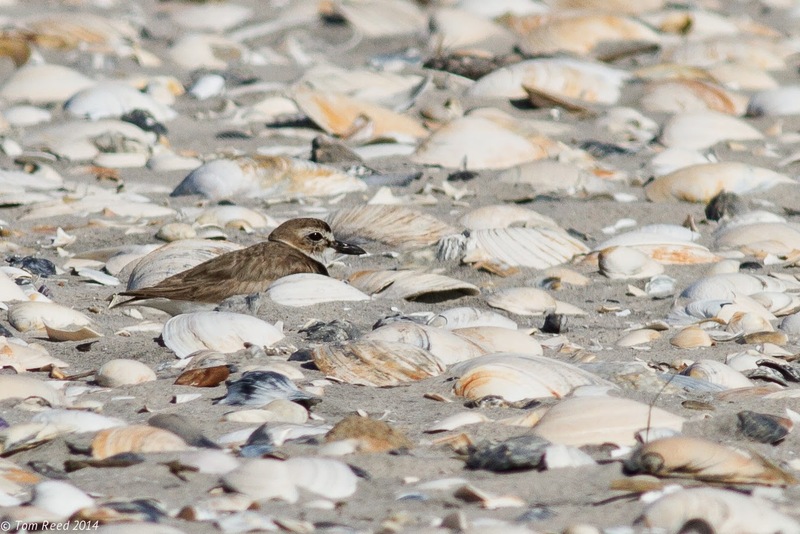 Cape May, NJ – June 3, 2014 – New Jersey Audubon (NJA) announced that David La Puma, Ph. D., has joined the team as director of the Cape May Bird Observatory (CMBO). David brings more than a decade of experience in ecological research to the CMBO; research that has focused on conservation of endangered species and identification of important stopover habitats for migrating birds. “We are very excited to have David join CMBO. His experience in bird conservation and research, educational skills and leadership in the birding community will allow us to grow and promote CMBO; maintain its excellent reputation; and further establish it as a top bird observatory in North America,” said Eric Stiles, NJA President and CEO. As director of CMBO, David will be responsible for leadership and direction of the Bird Observatory’s two sites in Cape May County (Northwood Center in Cape May Point and the Center for Research and Education in Goshen). He will be fully engaged in all program platforms, fund raising and special events. 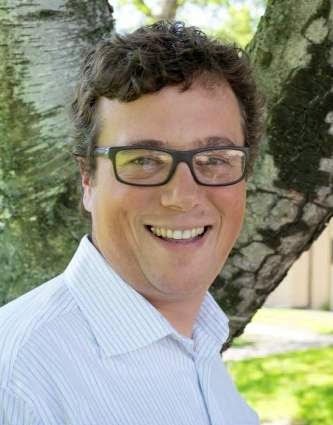 A talented teacher and natural leader, David has developed and delivered educational and instructional material to thousands of students, from ages five to 95. One of his greatest strengths is using his personal experience and social networking skills to bring diverse individuals together to work toward common goals.